If you have a fireplace that cannot function or won’t be used, you also have a problem: What to do with that leftover space–a space that’s not exactly designed for anything else. Fortunately, homeowners have some truly creative ways to use their hearths, even if it isn’t for a cozy fire. Here are our favorites. Note: If you won’t be using your fireplace again, remember to fully close and seal it to prevent drafts, dust, bugs, virds and other critters from entering your home! A renovated fireplace can make a perfect place for a pet area. Add a few blankets and favorite toys—along with sleeping baskets. And it could become your best friend’s new favorite spot! One of the most common choices is to fill a defunct fireplace with firewood. Homeowners prefer to stack it high and use attractive logs like beech or oak. And this keeps the primary fireplace theme and allows you to match other nearby natural woods…as long as the wood is pest free! Note that this, like most of our other options, works best with a wood fireplace and not so well with a gas fireplace. Another popular option is to clean and seal the fireplace, then stack the open space with books. And typically, this approach favors a “messy” look that complements a casual, cozy living room with a little artistic, disheveled stack of books. Also, this helps you use unwanted books that don’t fit on shelves or don’t look good enough for display elsewhere. Candles keep the flame alive in your fireplace without worrying about managing smoke and fuel. And this is a very cozy option, and with the right candlesticks to match your hearth, it can look very stylish too. Modern homes are also using a set of battery-powered lanterns if you don’t want to mess with open flames or wax. A traditional fireplace screen can provide beauty without the need to completely renovate the firebox itself (useful if you would like to use it again sometime in the future). And these screens, typically made of metal panels, come in many different designs and colors, allowing you to match them very easily with other décor. For a full renovation project, we suggest you build inset shelves in the old fireplace space. And these shelves can store décor, devices, books and more. They work especially well if you have nearby wood paneling that can match the shelves. 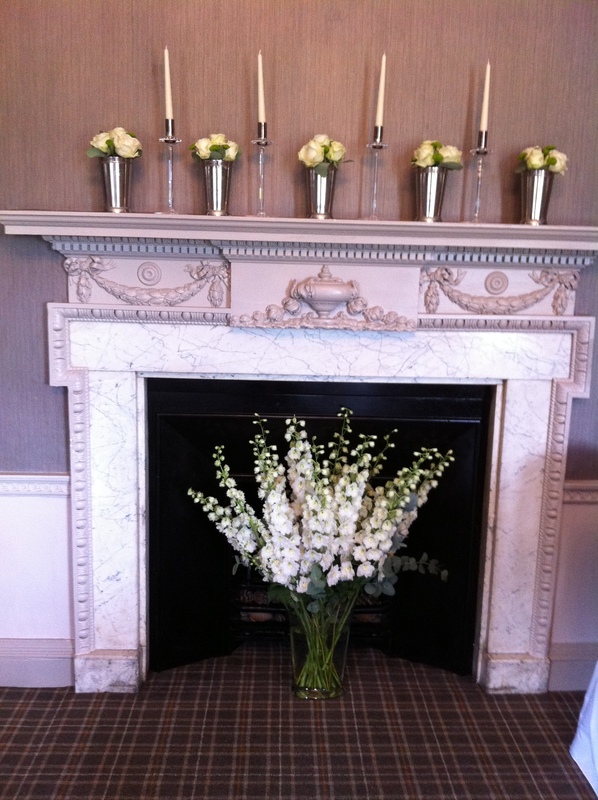 The empty fireplace makes a good backdrop for a bright vase or jar of flowers. And replace these flowers regularly to match the season and create a striking look. Or use dried flowers and branches for a more permanent, austere look. Much like a vase of flowers, a piece of art can look beautiful displayed in a fireplace opening (although you should measure carefully to make sure it’ll fit.) And the artwork both covers up the empty firebox and provides a focal point to draw the eye. Some people prefer to use several smaller panels of visual art stacked together, especially if they don’t want to hang them. Do you have a lot of old records lying around? Stack them in your fireplace as an easy storage option–this can also work with other types of media. However, records are particularly well-suited to fireplaces in terms of size, and add a hipster-y feel to more casual rooms. Do your kids frequently pull out toys to amuse themselves in the living room? Consider making the fireplace a toy nook to store all of their favorite toys in a basket or bin for easy access and easy clean up. Put a pot in your fireplace and grow a plant! And this works well with spreading, leafy plants that can spill out of the fireplace to get enough light and air, such as certain varieties of ferns.